If the development of open source Scrum tools was in vogue some years ago, a lot of these projects have now been abandoned. Some are still active, but this is because their development is sponsored by a commercial hosted option. There is however an alternative to manage your Agile software development projects if you have a low budget… and a small team. Some providers of commercial Scrum tools provide a free version of their software, often with some limitations. Only Scrum tools that offer a long term free commercial product features are mentioned in this article, not the tools that have only a time-limited trial version. We also dot not include companies that claim to offer Scrum tools… with an interactive Gantt chart ;O) Free Scrum tools often come with some limitation, which are mainly the number of users or the number of projects that you can manage with the tools and naturally the support you can get. If you are however a small Agile team, mainly less than five developers, focused on the development of a single product, these limitations about the team or the product will not harm your Agile software development project. Be careful however in how much you invest in a “free” tool as we have noticed in our previous update (September 2018) the disappearance of many offers and a general trend toward limiting the number of users from the remaining vendors. This evolution continues (March 2019) as we have removed vendors that don’t offer free option anymore and updated several tools that mostly lower team size limits (not the case for Riter or VersionOne). For free tools that are not based on a commercial offer, please consult our article Free Online Scrum Tools. If you know a free tool that is missing from this list, please use the comments or the contact form to inform us. This article presents a list of commercial tools for Scrum that are available for free. We have divided this list into two categories: the tools that you can install on your own hardware infrastructure and the tools that provides Scrum features as a hosted service that distributed teams can share. Tools that propose only a free trial limited in time are not included in this list. Although the information below has verified when the article was written, the free availability of the tools may vary according to vendor policy. Do not hesitate to contact us to add additional free commercial Scrum tools to this list or to communicate modifications in the information listed below. The tools are listed in alphabetical order. If you know a Scrum tool that is missing from this list, please use the contact form and we will add it in a next update. The feature set of Hansoft spans over agile ALM (Application Lifecycle Management), PPM (Product portfolio and program management) and Social collaboration. The tools woks on Windows and Mac OS. Acunote is a project management and Scrum tool that provides powerful analytics for data-driven project management. Agilefant is a Backlog management that has a local open source and a cloud commercial versions. It scales from personal todo-lists to large-scale multi-team development projects and portfolio management. It also supports long-term product and release planning needed for true organization-wide agility. Flying Donut is a powerful, simple, effective, Scrum software. You don’t need to adapt your implementation of Scrum to use Flying Donut. Flying Donut can easily be used by any Scrum team, with no configuration. Herogami is an agile project management tool with a kanban twist and an integrated approach with document management, wiki and calendar. iceScrum Cloud is the commercial version of the standalone open source Scrum tool iceScrum. This agile project management tool allows to manage the product backlog, releases and sprints with a visual taskboard. It offers also integration with the Jenkins continuous tool and various bug trackers. Krosswall is an online Agile project management tool for all type of projects. Scrum and Kanban wall/board are an integral part of the tool. Krosswall handles the synchronization between story/task walls, all statistics are updated fully at all times. Mingle and Mingle Plus are project management tools that support Scrum, Agile, Kanban project templates. They feature configurable project and team workflows, customizable card walls, list and hierarchy views. Mingle Plus is the multi-team version of Mingle. Riter is an online project management tools that applies artificial intelligence (AI) to project management. It provides intelligent sprint planning by analyzing developers habitual schedule, previous experience and accuracy in tasks estimation. Then Riter compares the load for a sprint with the team expected productivity to predict probable failures and warn you about them. Riter aims to be equally suitable for all types of companies, regardless of their team size, development methodologies and projects scales. ScrumDesk is an online Scrum project management tools for onsite or distributed teams to manage agile projects simply with an interactive task board. ScrumHalf is a tool that supports agile projects based on Scrum framework. It has several features for helping the customer and the project team. It offers a version in Portuguese. ScrumTool provides a taskboard for agile projects management. ScrumTotal is simple online Scrum tool that covers all the common usage scenarios in Agile project management. It is a cloud-based web application which works on Android and iOS devices. The sync-up feature on mobile and desktop allows to use it on the go. Scrumy is a project management tool loosely based on Scrum. Silver Catalyst is an agile project management tool for Scrum and Kanban teams that use lean or agile methods. 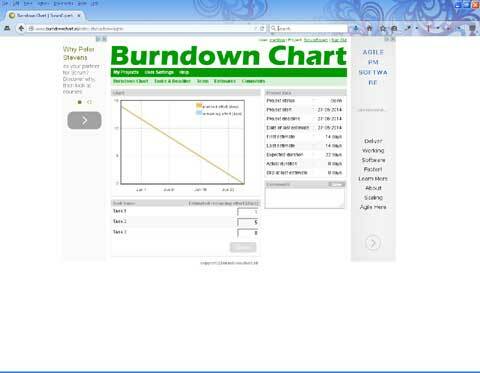 SprintGround is an intuitive tool that software developers use to significantly increase efficiency of their projects. SprintGround support Scrum and Kanban and includes useful planning and management tools like Product backlog, Burndown chart and Kanban board. Taiga is a project management platform for Agile developers, designers and project managers who want a beautiful tool that makes work truly enjoyable. It has both a open source version and a commercial hosted offering. VersionOne is a Scrum tool that allows centralized story and defect management, release and sprint planning, online storyboard, taskboard and testboard. Visual Studio Online provides cloud-based collaboration services for version control, agile planning, continuous delivery and application analytics for Visual Studio, Eclipse, Xcode or any other. The tools for Agile teams allow to use Kanban and Scrum. You can capture, prioritize, and track work with backlogs and customizable Kanban boards. Work items link directly to code to ensure transparency and can be used to build rich dashboards for easy reporting. VivifyScrum is a single page cloud-based Agile project management tool that allows you to easily configure and organize your team. You can choose between Scrum and Kanban board. The Scrum board offers a Product Backlog, Sprint and Burndown charts. Yodiz is Agile Scrum tool and issue tracker. Yodiz has a large set of features with nice user experience. There are boards for Sprint, Releases and issues management. Prioritized Product Backlog and Epics are also available. YouTrack is a software development tools that implement bug tracking and agile project management with support for both Scrum and Lean methodologies. It helps to manage your backlogs, create a number of sprints, group your tasks in swimlanes, move your tasks around the board, track progress and detect bottlenecks early and more. Zoho Sprints is an online Agile software development tools that provides features to create user stories, add estimation points, stay on track with personalized scrum boards, and schedule your review and retrospective meetings from one place. No mention of Rational Team Concert’s 10 free user licenses? Thanks for the suggestion, I added the tool. JIRA. It’s worth noting that JIRA’s free trial version lasts for 90 days (get the Download version, 30 day trial. They let you renew it twice). This was handy because our project was only 2 months. It also gives unlimited users for that time. Acunote – best one of all. Also free forever for 5 users. Thanks for the suggestion, I have added it to the list. Would be great to add Yodiz into this list. Yodiz is Agile Scrum Tool & Issue Tracker. Yodiz has excellent set of features with nice user experience. There are boards for Sprint, Releases and issues management. Prioritized Product Backlog and Epics are also available. And yes, it does have a commercial option as well – which is dedicated to keep Agilefant at the top of the open source category. Currently, all Cloud accounts include two free seats. This means, that if you have two (or less) enabled users in your account, you’ll never have to pay anything. However, we are looking into raising the limit to five, to get entire teams on board. Thank you so much for this excellently helpful article. What a fine service you’ve done me. May I present SprintGround! It’s designed to be as effective and useful as possible. Would love to see our creation on the list! Thanks for your suggestion. I will add it in my next update. Thanks for letting me know. I will add it in my next update. Gave me a great headstart in Agile tool selection. From your concise and easy-to-read article and the comments, I was quickly able to create a shortlist for further evaluation. Thank you very much. You saved me a stack of time. I am glad it helps you and thanks for everybody who can contribute to keep this list up to date. ScrumHalf is in Br. Portuguese and English.